Do we ever know our parents? Simon got me blogging. My first post was a guest spot on his blog about 8 months ago. When he said he’d like more guest posts I nearly didn’t offer as I’ve already got one, months overdue, for someone else though that’s about writing and Simon’s open with topics. My first post here was about Mum and when I wanted to write something about Dad your blog came to mind. Many thanks for the offer. This year, what with all the wonderful weather, hot, wet, wet, hot, my garden, like yours too maybe, has been rather overgrown and all the expectations I had of it were dashed. It became even more of a wild woodland than it usually is. Finally I decided I had to brave the nettles and bramble to go gathering blackcurrants. It would be my last chance of the year, the birds would already have had many, but the bush decided to expand beyond it’s boundaries last year and I knew there would still be a great crop. What does this have to do with Dad? Lots, please bear with me. Every time I do anything with any of my blackcurrant bushes I think of Dad, smile and wonder if he liked blackcurrants or not. I’ve only had blackcurrant bushes for the past 6 years and have had a wonderful crop every year. More bushes have grown and I now have quite a few all cropping well. I prune occasionally and try to follow the pruning as suggested in Dads month by month gardening book which I remember him pouring over. My smile? Every year when there was just Dad and I after others had left home and Mum had died I would look forward to having some blackcurrants fresh from the bush. Every year the bush did poorly. Dad would explain to me how sad he was that the bush had done so bad and I believed him. Now having grown my own blackcurrants I am left wondering. They only do badly if you have a dreadful year or if you over prune them. Dad was a brilliant gardener and grew fantastic fruit and veg. I can only conclude that he deliberately over pruned them each year as I remember having tons of blackcurrants when mum was alive. 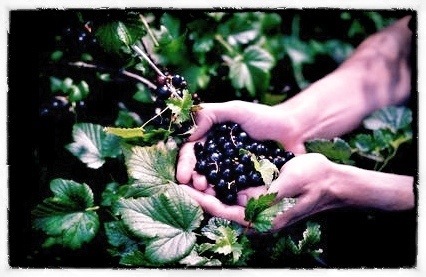 Each year, when I pick my blackcurrants, I can’t help but smile and remember how much I love my Dad. What will your children know about you? What do you know about your parents?